Prior to the United States arming “freelance jihadists” with ties to al Qaeda and dropping countless bombs on their cities, Libya was a bastion of development and quality of life in Africa. Muammar Gadaffi was certainly no saint. However, the Libyan people are now far worse without his regime in power. 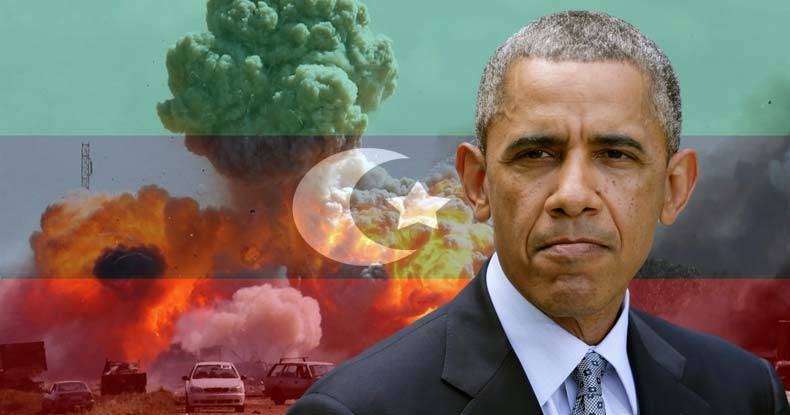 The condition of Libya — post-US intervention — is so horrid that Barack Obama is calling his post-invasion reaction to ousting Gadaffi — the worst mistake of his presidency. Sunday, Obama went on Fox News to discuss the highs and lows of his presidency. During the Q and A, Chris Wallace asked Obama what the “worst mistake” was that he made as president. While the US government is known for its irresponsible and deadly incompetence, the idea that they had “no plan” after invading Libya is asinine. Libya, like the rest of the countries in the wake of the US war machine was more than likely meant to be in a state of disorder. After US intervention, the country quickly descended into chaos as rival governments and armed groups fought for control, providing Islamic State (IS, formerly ISIS/ISIL) and other extremist groups with the opportunity to gain a foothold in the oil-rich country. According to RT, Libya is now a key operating base for IS terrorists, and other local militant groups control large parts of the country as well. Destabilizing the region, while it has displaced and left dead hundreds of thousands of people, has proven highly beneficial for US interests — especially banks and oil companies. Hundreds of thousands of Libyans gathered on Wednesday to discuss the proposal by their leader Muammar Gaddafi to disband the government and allow the country’s oil wealth to flow straight to the people. Nationalization of a country’s resources is often a cause for invasion. For example, Guatemala’s nationalization of its fruit processing facilities led to a U.S.-sponsored coup. As the Free Thought Project reported, an April 2011 email, sent to the Secretary of State Hillary by unofficial adviser and longtime Clinton confidante Sidney Blumenthal with the subject line “France’s client and Qaddafi’s gold,” revealed the predatory intentions of the West in Libya. While the emails from 2011 indicate recent Western intentions in the invasion of Libya, toppling Gaddafi had been in the pipeline even before 9/11. With Iraq, Syria, Libya, and recently Somalia all finding themselves the subject of deadly and chaotic US intervention, Sudan and Lebanon should take heed. Iran is already feeling the heat and has been for some time as propaganda campaigns of fear have been waged against them by US interests worldwide — in spite of Iran not attacking a single county in decades. The notion of Obama acting apologetic or even hinting at it by calling the Libyan aftermath his “worst mistake,” rings hollow to those who’ve watched this Peace Prize recipient lay waste to the Middle East during his last 7.5 years. If by “worst mistake” he means getting caught for his war crimes, then we can agree. Perhaps the reason the US is now rattling the saber toward the Russians is because they called a spade a spade on US foreign policy in Libya years ago, saying that UN Resolution 1973 spoke only of establishing a no-fly zone to guarantee civilian security, and was not a green light to bring about regime change.